Pulmonologist, thespian, award-winning baker, competitive swimmer, art collector and performer in an all-bassoon band; this sounds like the description of a roomful of people, but in reality it is a rundown of the many hats worn by Ronald Bronitsky, M.D., ‘77. After Bronitsky sees patients in his pulmonary practice with Presbyterian Medical Group in Albuquerque, New Mexico, he often heads to a rehearsal—either for his next theatrical production or for a performance with the Bosque Bassoon Band. If there’s no rehearsal, he might roll up his sleeves to bake a few of his pies—maybe a prize-winning lemon meringue or autumn harvest pie. 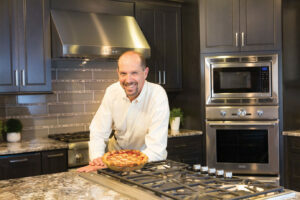 He learned how to bake pies from his mother, and given his decidedly competitive nature, he developed his own recipes. Bronitsky soon began bringing home prize ribbons at the state fair, and he moved on to the yearly pie championships held by the American Pie Council. He has bragging rights to having won “best in the country” for his cherry pie. He’s even designed a special kitchen in his new home, with space just for baking. After graduating from VUSM, Bronitsky completed a three-year internal medicine residency at Vanderbilt. He gives the school a lot of credit for how he lives his life today. He remains close to many of his friends from that time, meeting with them every two or three years. This year, Bronistsky, Joe Little, M.D., Steve Hines, M.D., Scott Harriage, M.D., Bob Latham, M.D., Ted Garrett, M.D., and Byron Hogsette, M.D. are gathering in the San Juan Islands. In addition to maintaining those relationships, Bronitsky feels a personal obligation to give back to the medical school. He is a white coat sponsor for first-year medical students, and he’s named the School of Medicine in his will.